The HYDROGEN One smart phone with the holographic display. It looks like no other phone on the market. Comes from one of the most esteemed names in digital cameras. And has a screen unlike any other phone selling today. It it unique, it is expensive. And it is a complete mess. So I've been pretty excited for this phone. RED announced it more than a year ago and it's been talking about this holographic display since then. But the phone kept getting delayed and pushed back and pretty much no one's been able to see it. They've shown it to a handful of people. But no one's been able to film the screen and so we've kinda just had to work off of what people were describing it as. And so, I've been here imagining that a holographic screen is kinda gonna float above the display and have this very cool, you know, hologram. But, that's not what this is at all. - Oh my God. (laughing) - What? - This is very nauseating. - My question is why? - Maybe the further you hold it, uhhhhh. - Ahhh. - This is kind of hurting my eyes. I can't imagine using this every day. - My eye are tearing watching this. - There's really no elegant way to say this. The screen is just bad. Like really bad. But unfortunately it doesn't show up on video very well. So I'm gonna do my best to describe it to you. We also made this graphic to try and help. You know those lunch boxes or post cards with a lenticular screen that kinda changes as you rotate it side to side? That's basically what this is. If you've ever seen a Nintendo 3DS, it's pretty much the same thing. I actually think the 3DS is better than this. Most of the time you're using the phone nothing is quote unquote holographic. Everything is flat, 2D, just normal when you're on the main interface, browsing the web, using your regular apps or whatever. RED has a separate app store that includes a very small number of game and movies that work in this holographic format. For whatever reason, RED calls it 4V or 4-View, instead of 3D. Nothing ever pops out at you when you're seeing a 4-View image or game. But when you're in those apps you can see a little bit of depth into the screen. But the depth you see isn't that convincing. I wasn't even sure I was seeing it half the time. And it works really unevenly. Most things are really bad and look kinda like flat, gimmicky cutouts. Others, especially video where the depth is much more natural, actually have some potential. But the key thing to know is that it just looks bad when the holographic mode comes on. The screen looks really blurry, like the whole thing is smudged up and nothing is sharp and clear. I think that's because there's an actual hardware layer in here that's changing how many of the pixels you can see. I played a few games this way and I didn't feel like it added much to the experience. I think the 4V made the games worse too. Just look at how poorly the Subway Surfers ripoff staring Paddington works. It gets choppy all the time. The other big deal here is the cameras. There are dual 12 megapixel sensors on the back and dual 8 megapixel sensors on the front. And both sides can be used for capturing 4V photos and videos. Before I get into that I want to say that as regular 2D cameras they're actually pretty good in a lot of cases. Now you're not exactly getting RED color science here. RED says there's just not the horsepower. And you're not using a RED sensor either. I think it's probably the same Samsung or Sony stuff that everyone else is using. The colors look rich and natural, though. There's style without them being stylized. But it can't match the Pixel when it comes to dynamic range. I often found that the HYDROGEN One would blow out highlights that the Pixel could clearly capture. It also struggles in low light and the photos often weren't very sharp either. The real highlight here is supposed to be 4V mode where you can capture 3D photos and videos. The photos are pretty skippable. They don't capture a lot of depth. And eventually I started making everyone pose in these cheesy ways once I realized that made it look the best. I was surprised, though, the video is, there's something to it. I can actually see the depth a bit. It a much subtler effect and it's kind of cool. It's still a pain to watch. It's smudgy and the effect tends to flicker in and out with a lot of artifacts. Some people said it made them dizzy. But when it works, you can kind of understand what RED was thinking. Unfortunately you can't really share it with anybody. Even if you do get really into shooting 4V, they won't be able to see it unless they have another RED phone. It just looks like 2D to the rest of the world. RED does include an app called Holopix which is sort of their own social network. It's supposed to be like Instagram for RED phone owners who shoot 4V. But I haven't actually been able to test it. Every time I try to log into the app it just crashes when I press the sign in button. The funny thing is, RED isn't even the first company to try this. If you remember back in 2011, HTC actually did this with the EVO 3D. It did the same thing. There was a dual camera on the back for capturing 3D photos and it had the same kinda screen, where you could tilt it and view it in 3D. Now in fairness to RED it does look better on the HYDROGEN One. It's a little bit clearer and the photos and videos do turn out better. But the tech clearly has not developed a lot in the time since and it kinda says a lot that RED hasn't meaningfully improved the experience since 2011. So now I want to talk about the rest of the phone. 'Cause there is a lot of phone here. I actually dropped it and injured somebody with it. But props to it for at least trying something different here. I don't really like the design, but there's a lot going on and it looks unlike anything else. There are a bunch of textures on the back. There are the grips for your fingers on the side that don't strictly make it easier to hold but are interesting. I also like that there's a shutter button on the top. Unfortunately its less interesting on the inside. That's because it was supposed to come out last year so it's running on a Snapdragon 835 whereas the rest of this years flagship phones all have the Snapdragon 845. There's one other big feature on this phone that's supposed to make it unique. And that's these accessory pins on the back. They're supposed to let you connect all kinds of interesting things. The biggest being a full on RED camera sensor which you'll be able to attach real lenses to. But, that doesn't exist yet. There's nothing you can add onto the phone today. And given that the phone was already a year delayed, who knows when these accessories will actually ship. RED hasn't even offered any details on the sensor's capabilities let alone its price. And so ultimately all the big things that RED set out to do here, all the ways it wanted to stand out, they just don't hold up. And since it's not particularly great at the basics, and costs an incredible $1300, it's just impossible to recommend. I really wish it didn't go this way. I think it great that someone is trying something different when it comes to mobile phones. And the concept of a RED camera in your pocket? That's really exciting. But it's not what we got. Right now this tech just isn't ready and you probably should pay $1300 to beta test it. (electronic swooshing) Hey, what's up, we're filming on an EVO 3D right now because we can't actually export 3D from the RED phone. 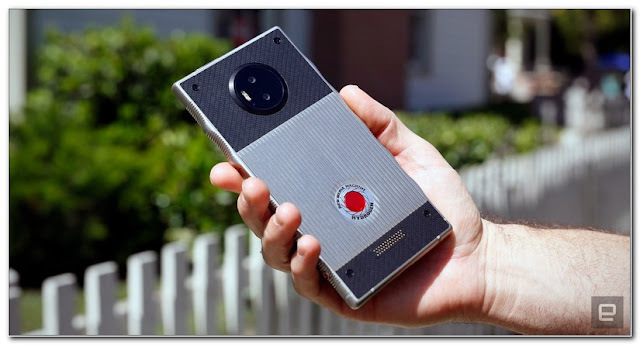 0 Response to "Red Hydrogen One Review: A $1,300 Mess of a Phone"